Available in all sizes and can be cut to any desired length. 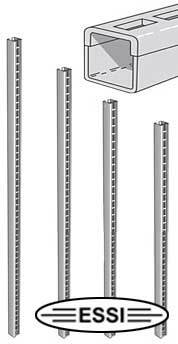 Gondola Wall Uprights are compatible with Lozier and Madix Shelving. Best used when fastened directly onto wall studs that are space in 16" increments by stand city and county building codes in most states, cities, and counties. Will not support as much weight as your standard Gondola Shelving as there are no base shoes difectly conected to the bottom of the upright to support the load. Gondola Wall Uprights mount directly to existing will in wall studs placed every 16" apart. This means that the 4' upper shelves would work the best in this configuration.